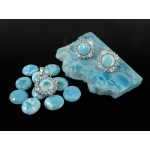 Larimar is an extremely rare gemstone that has been found in only one location: in a mountainous, relatively inaccessible region of the Dominican Republic overlooking the Caribbean Sea. As you see its attractive clouds-like color, its hardness, ability to polish and shine of this stone makes an excellent material for jewelry. Noa Sterling Silver Ring with Larimar, Dimensions: 27.70 hight x 22.30 width mm.,Oval 24x20 mm. ..
Noa Sterling silver Ring with Larimar, Dimensions: 29.40 hight x 22.60 width mm.,Oval 12 x 9 mm. ..